1. Preheat oven to 180⁰C. Grease four ½ cup (125ml capacity) ceramic ramekins and arrange on a baking tray. 2. Melt chocolate in a heatproof bowl over a saucepan of simmering water. Stir until smooth. Remove and allow to cool. 3. Place butter, eggs, flour and sugar in a food processor and process until smooth. Slowly add the cooled melted chocolate and mix until combined. 4. Carefully spoon 1/3 cup of mixture into each ramekin and bake for 15 – 16 minutes or until cooked on the outside. Stand for 5 minutes in ramekins. 5. For the coulis, combine sugar and water in a medium saucepan, stirring over a medium-low heat until sugar dissolves. Add berries and cook, stirring for 2 minutes. Remove from heat and push mixture through a fine sieve. Transfer to a serving jug. 6. To serve, gently invert warm fondants onto serving plates. Garnish with cream, berries, a drizzle of coulis and a dusting of icing sugar. This entry was posted on October 6, 2010 at 2:05 pm and is filed under Cooking, Family, Friends, Random, Recipe. You can follow any responses to this entry through the RSS 2.0 feed. You can leave a response, or trackback from your own site. Is this the one Sam made on MC Oz? Looks yummy, Amanda. There’s just something about raspberries and chocolate – so love that combination. I probably wouldn’t stop eating if I came to visit you, either! Great choice of dessert…Love strawberry coulis..raspberries will do fine too! My mouth is watering as I read the recipe. It’s not cake but more like fudge but not. A fancy dessert fit for a king’s table! Raspberries go fabulously well with chocolate, too. I looooove chocolate. 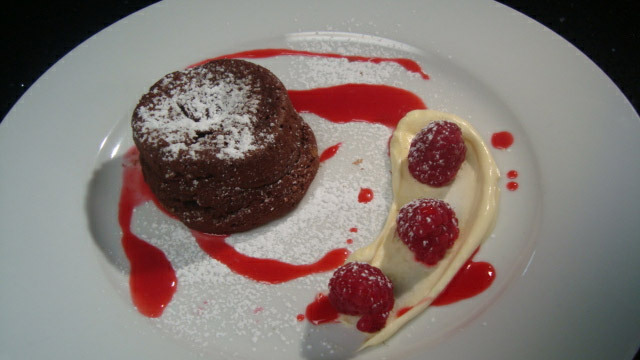 Thank you for sharing this appealing recipe for fondant with fresh berries and raspberry coulis. Blessings, Amanda….